Experiencing the future of energy: University students explore Malampaya Phase 3. 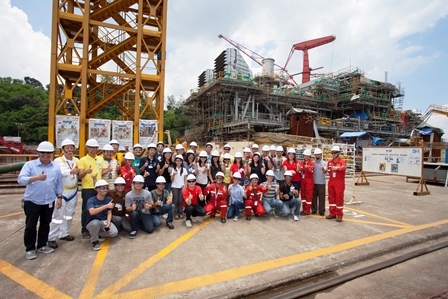 Shell Philippines Exploration, B.V. (SPEX), operator and developer of the Malampaya Deep Water Gas-to-Power Project, opened the doors of the Malampaya Phase 3 Fabrication Yard at the Keppel Subic Shipyard last August 20, 2014 for university students to appreciate the pioneering energy technology and innovation that Shell implements in the country through the Malampaya Phase 3 (MP3) Project. Around 30 students from Ateneo De Manila University, De La Salle University, University of the Philippines – Diliman and University of Santo Tomas were given the once-in-a-lifetime opportunity to tour the MP3 fabrication yard. MP3 marks Philippine history as the first innovation of its kind in the country’s energy technology. This first offshore gas platform to be built in the Philippines, with its technologically innovative capacities, will enable it to “self-install” using a built-in jacking system beside the existing Malampaya offshore platform located in the West Philippine Sea, near Palawan, early next year. 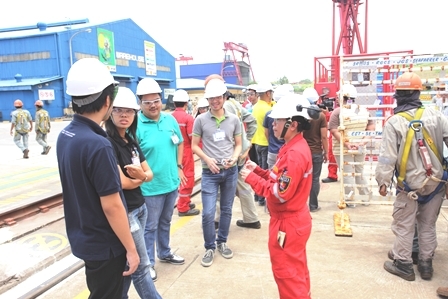 University students tour the MP3 Fabrication Yard facilities with [leftmost] Shell Upstream Communications Manager Paulo Gavino, [4th from right, kneeling] Shell HR Country Recruitment Manager Janice Benavidez-Pamplona, [from rightmost] Keppel Subic Shipyard President Leong Kok Weng and MP3 Company Site Representative Nathan Stephenson. Behind them can be seen the country’s first offshore gas platform being built. During the tour, the students visited the fabrication yard’s Dry Dock Gangway and Pipe Shop. The Dry Dock gave a full view of the MP3 platform slowly coming to completion and where one can appreciate more fully the towering1500T gantry crane—the tallest in South East Asia—that was built to execute difficult heavy-lift activities for MP3. In the Pipe Shop, the art of welding was explained amidst a backdrop of exotic pipes of different shapes and sizes that were made to be components of the second offshore gas platform. Stephenson [3rd from right] with SPEX Discipline Engineer Lowell Morales [leftmost] explains the different activities in the Pipe Shop. 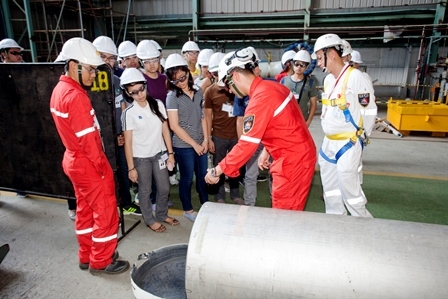 The tour enabled the aspiring engineers to know Malampaya for more than its iconic image of a gas platform in the middle of the sea that supports Philippine energy security. The students met the people behind Malampaya—some of the young and seasoned engineers of SPEX who shared the inspiring stories of their career journey. Cheryll Lucas, SPEX Operations Engineer and Ronald Montales, Malampaya Phase 3 Mechanical Engineer, shared their stories of passion and pride. “The highlight of my career was when I got assigned to work offshore, on the Malampaya platform. I was really proud to work in an engineering marvel, an innovative feat in technology for the country,” revealed Lucas. “I remember asking my supervisor to be given the opportunity to operate the platform as a control room operator. It was a proud moment and an exhilarating experience for me when I finally got to start up the platform from black start condition until it was exporting gas and the whole plant was stable,” she added. Cheryll Lucas answers questions from enthusiastic, aspiring engineers during the MP3 Dry Dock tour. “Shell is really committed to develop its people. You get to reinvent yourself. For me, I feel proud to be with SPEX, and part of the team that actually develops Malampaya Phase 3 because I get to fulfil my dream as an engineer –and that is to contribute in the design and construction of a gas compression facility. And more than this, I get to be part of a project that is of national significance—that helps power Philippine progress,” said Montales. SPEX is the upstream operating company of Shell in the Philippines that explores and develops the country’s oil and gas industry such as the Malampaya Project. Another young SPEX engineer, Lowell Morales, shared the inspiring story of how his career in Electrical Engineering began with Shell. In his testimony, Morales proved that opportunities are not based on where you came from or which school you attended but rather on individual capabilities, right attitude and perseverance. Morales graduated from Holy Angel University in Angles City, Pampanga. He never dreamed he’d work in Shell or on the Malampaya Project, much less leave his hometown. Thinking he took a shot for the stars, he applied in Shell through the online application. Little did he know this will change his life. After a series of rigorous screenings, Morales got a coveted spot in the Shell Graduate Programme. As management trainee, Morales received world-class training and education to develop his potential as a leader in the company, and flexibility to work in any of Shell’s business or department. He was given the opportunity to travel the world, for his personal and professional development. MP3 Company Site Representative Nathan Stephenson gives an orientation on the Malampaya Project and shares the story of his inspiring career journey. MP3 Company Site Representative Nathan Stephenson, who joined Shell as an Engineering graduate in the UK, shared some insights regarding his journey in Shell. A career which has already spanned four different countries, Nathan’s advice was to always look for opportunities to develop, be mindful of golden opportunities and when they come, grab them with both hands. “Thank you for this opportunity to learn more about Shell and Malampaya,” said one student from the group of young, aspiring engineers. They thanked Shell for the opportunity to learn more about Malampaya, what the Project does for the Philippines and for the exposure that, in its own way, will help them decide and pursue the kind of future they would want to shape for themselves and for the country. 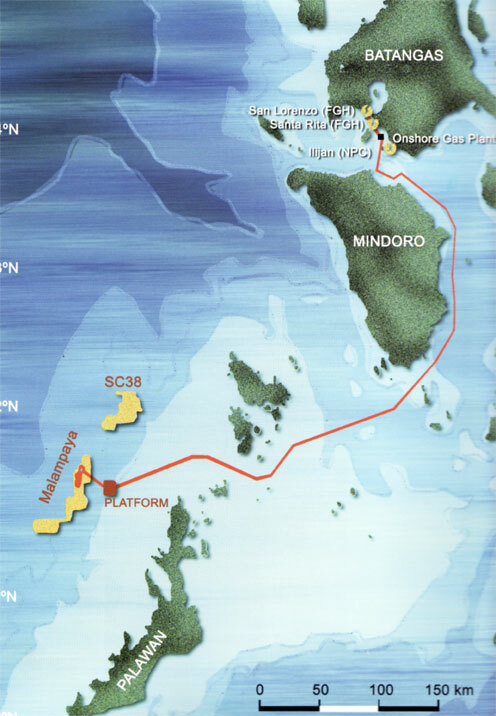 The Malampaya Phase 3’s additional offshore gas platform, together with Malampaya Phase 2’s additional deepwater gas production wells that were completed in 2013, will sustain the level of natural gas being harnessed by Malampaya to power 25-30% of the country’s electricity needs. The Department of Energy spearheads the Malampaya Project that SPEX operates on behalf of joint venture partners.